ArenaNet’s taking PvP in Guild Wars 2 to a new level, with Tuesday’s update that brought the first PvP League Season to the game. The leagues mimic ranked play in other games and are a sort of middle ground between purely casual play and high-level, e-sports caliber gameplay. As players win matches — or do well in matches against superior opponents — they’ll climb up six divisions, starting with Amber and going all the way up to Legendary. Each division is broken up into tiers, and in lower divisions, your backwards fall when you lose matches is limited. Each new tier and division unlock grants rewards, such as gold, dyes, Shards of Glory, and Transmutation Charges. 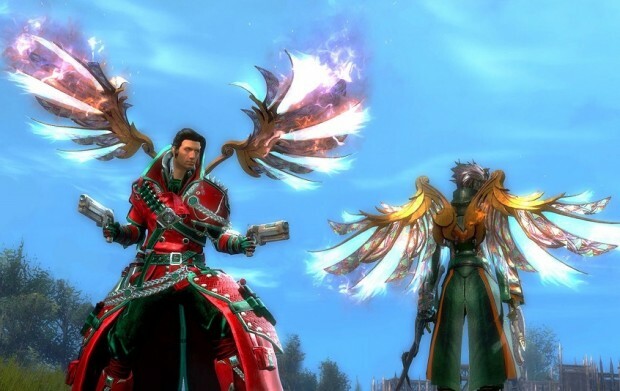 As players advance, they’ll unlock more and more impressive-looking Wings of Glory to flaunt their PvP prowess. Eventually, players will be able to work toward and complete a legendary backpiece that’s exclusive to PvP players. Additionally, guilds can form teams to compete in the Guild Challenger League and win decorations for their guild halls — and, if they’re good enough, spots in the ESL Guild Wars 2 Pro League. You can get a breakdown of the basics of Guild Wars 2 PvP Leagues in this blog post from August and in yesterday’s announcement.